Specially designed for teeth that are sensitive to whitening. Are you hesitant to whiten your teeth because you’re afraid of whitening related sensitivity? 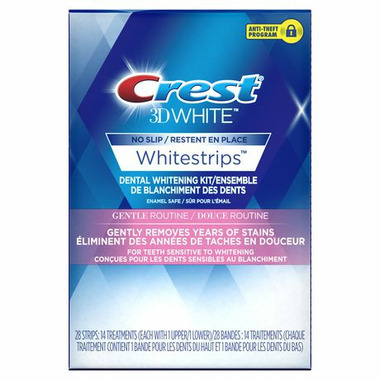 Crest 3D White Gentle Routine Whitestrips reveal your beautiful, whiter smile gently and gradually, with just 30 minutes once a day. Now there’s nothing preventing you from getting a whiter, brighter smile. Use once a day for 30 minutes for gradual teeth whitening. A comfortable at home teeth whitening experience. Ingredients: PVP, Water, PEG-8, Acrylates Coploymer, Hydrogen Peroxide, Sodium Hydroxide, Sodium Saccharin.